Actresses Michelle Yeoh (杨紫琼) and Qin Lan (秦岚) walked the red carpet of 7th Asian Film Awards held at Hong Kong Exhibition and Convention Centre on March 18, 2013. Michelle Yeoh (杨紫琼) was my best dressed that evening in a stunning lace embroidered how from Elie Saab Fall 2012 Haute Couture collection. A minaudière and silver jewels to complement her outfit. 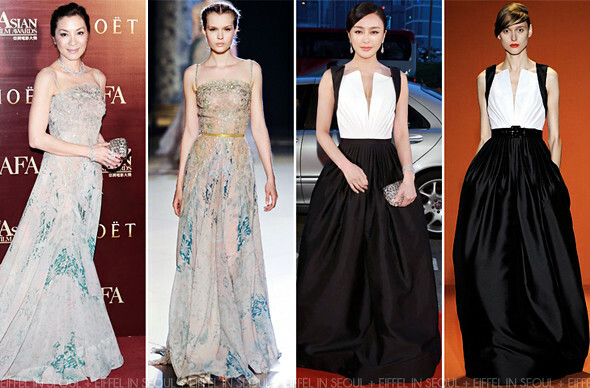 Qin Lan (秦岚) wore a monochrome gown with a full skirt from Andrew Gn Spring/Summer 2013 collection.